Goodreads says, "Three college roommates are celebrating a twentieth wedding anniversary by taking a cruise to Bermuda. As the ship pulls away from the pier, everyone is looking forward to lounging by the pool, sipping sunset cocktails, and reminiscing. Abby, the mother hen of the group, will be celebrating her wedding anniversary in style, even as she and her husband keep a secret from the group. Ambitious career woman Caroline happily anticipates several stress-free days away from her magazine job with her boyfriend, Javier, who may or may not be finally inspired to propose. And single mom Lee (annoyingly gorgeous and irresistibly popular in college) hopes she’ll win back the affections of her formerly sweet daughter Lacey, who after her first year in college, has inexplicably become a little bit of a monster. As the balmy pink shores of Bermuda come into view, tensions simmer, and old jealousies flare, sending the temperature from soothing to scorching in this engrossing tale of three best friends on a vacation they won’t soon forget—but not for the reasons they expect." Lee, Caroline, and Abby were college roommates and the best of friends. They often get together, but this year they are doing something special. They are taking a cruise to Bermuda in honor of Abby's 20th wedding anniversary. It should be fun. Think cocktails, sunset, lounging by the pool.....what could go wrong? But throw everyone and their families on a cruise ship, things are bound to get dramatic. Plus, Abby is hiding a major secret from everyone except her husband. Caroline, still single, is bringing her boyfriend Javier, but things are complicated. Caroline is hoping he will finally propose to her. Lee, a single mom, is bringing her daughter, Lacey, but after her first year at college, she has come back a different person and is hiding secrets of her own. Then there's Abby's two rambunctious high school boys who will most definitely get in trouble on a cruise ship. There are some obvious challenges facing the three women, but such strong friendships can weather any storm, right? 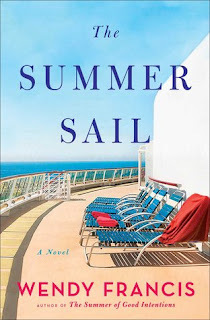 Wendy Francis' The Summer Sail is such a great beach read. Who doesn't want to be transported to a luxurious cruise ship en route to dreamy Bermuda? I actually enjoyed all three women in The Summer Sail. I felt the most for Abby as I could connect with her the best, but I appreciated all of the women and their struggles. Abby is obviously hiding a secret and my heart went out to her as we slowly piece together what she is struggling with on a daily basis. Caroline wants to take the next step in her relationship since she isn't getting any younger and she is hoping Javier will man up on this trip. I am not sure her friend's 20th anniversary celebration is really the best time to think about your significant other proposing, but that's her main focus. Lastly, there's Lee who has built her life around her only daughter, Lacey, except she has returned from college with a serious boyfriend and a seriously bad attitude. Lee is hoping this trip will reestablish their relationship, but Lacey is annoyed there is not internet access on the ship. I loved that all three women support each other and their friendship has truly survived years of ups and downs. The flashbacks to college were especially fun and helped to develop their characters even more. I have never read a book that takes place on a leisurely cruise, but reading one that does during during spring break or while on vacation is simply perfection. The views, the drinks, the fancy dinners, the ocean, the ship's balconies, and the Bermuda beaches all had me pining for a trip to the Caribbean. I loved Francis' descriptions of the cruise itself; it felt like I was on vacation with all of the ladies and who doesn't love a group vacation with your best friends? There are some unexpected twists in The Summer Sail, some that I saw coming, others that took me by surprise. My only issue was the one major secret was predictable and sometimes the characters hyper focused on their own problems, but other than that I thought The Summer Sail was a fun beach read with an incredible setting. This definitely sounds like a great summer book. 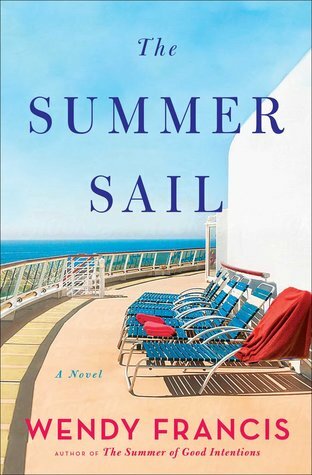 Friendship, secrets, a cruise setting - great review! I loved the cruise setting - so, so fun! Thanks for dropping by, Angela!